These are the words of Jodi Rogers Kennedy that I found on Barbara’s Facebook page on Monday morning. It was just one of several postings from women who knew Barbara from Hour Children. It is a wonderful tribute to a woman that they admired and respected and with whom they formed a special bond. I knew about Barbara even before I met her. My college roommate and dear friend, Betsy Baldwin, and Barbara both attended St. Jean Baptist High School in New York City and graduated in 1957. Betsy went to D’Youville College where I met her and that same year, Barbara entered the Grey Nuns of the Sacred Heart and so began her life as a daughter of St. Marguerite. Barbara traveled to high school from her home in Corona, NY. Her sister, Pat, told me that their mother, Delia, packed juice and a snack for them to eat for breakfast after Mass and before school. Those were the days when one had to fast before receiving Communion. Barbara and Pat and their brothers, Frank and Mike, shared a home with their two loving parents both of whom hailed from the “old sod”; Delia who changed her name to Delia from Bridget because she thought Bridget sounded too Irish came from the Aran Islands and Luke was a native of County Monaghan. Frank was the oldest, Barbara not far behind and Mike a year after Barbara. Their sister, Pat, was always the “little sister” – 5 years younger than Mike – and as little sisters do – wanted to be included with Barbara’s friends. Pat acknowledges that Barbara often did share her high school friends with Pat and “took her along” often. The women who entered the Grey Nuns of the Sacred Heart novitiate in 1957 were called a “band.” That is what the congregation called each group who entered. The custom was for the congregation to name a “doyenne” – that is, by the dictionary meaning, the senior or eldest female member of a group, especially one who is most, or highly, respected. The custom in our congregation was to name the eldest member. According to Sheila Stone, a member of the band, the congregation experimented that year and had the members of the band elect a doyenne. Barbara, though not the eldest, was elected. This was an indication of the regard in which she was held and also of her ability as a leader. This leadership ability was once more acknowledged when Barbara was appointed Superior at Holy Angels Convent in Buffalo at a very young age. After more than 13 years as an elementary school teacher – in many schools such as Christ the King, St. Canicus, St. Norbert’s, Our Lady of the Assumption, Our Lady of Fatima, Melrose Academy, and Holy Angels, Barbara began studies for an MSW (Master in Social Work) which she completed in 1975 at Fordham University. Again, according to both Pat and Sheila, she loved social work, she loved empowering people and this work gave her many opportunities to do that. Both remarked that she hated the paperwork involved. Over the years, from 1975 she worked in many agencies, the New York Foundling Home, the Visiting Nurses Association, the Red Cross where she was Program Director and Coordinator, Catholic Charities where she treated those with alcohol addiction, the Center for Children and Families – all in the greater New York area. Barbara found her real home at Hour Children, a facility founded to assist incarcerated, and formerly incarcerated, women and their children successfully rejoin the community, reunify with their families, and build healthy, independent, and secure lives. Her work there involved visiting the women in prison, working with the children, and supervising staff. She and Sister Tesa Fitzgerald were a good team. Barbara retired from Hour Children in 2014. Pat told me that she wanted to continue but the visits to prison required a great deal of walking and that had become very difficult for her. But Barbara was not all work. She loved life. She was warm and enthusiastic, an extravert, she had a knack for listening and a way of attracting people. This was her charm. In the late 80’s, our vacation house in Cape May became a welcome spot for many GNSH. When Barbara and Lucille (Barbara’s dear friend of many years) arrived, they were warmly welcomed as they had a way of livening things up. Barbara was a great cook and often provided a special meal for all. Many Grey Nuns of the Sacred Heart will remember those days fondly. After our house was sold, Eileen White, Eileen Spanier, Maureen Quigley and I vacationed with Barbara and Lucille at other rented homes in Cape May. Once again, we got to enjoy many delicious meals. (I think this love and knack for cooking came from her mother. Pat relates that their house in Corona was a gathering place and their Irish mother, as Pat noted, was all food, food, food.) This is when I first got to know and love both Barbara and Lucille, a friendship which continued. I had the privilege of being Barbara’s LAG (Local Area Governance) coordinator and walked with her during the illnesses of these last years. Barbara’s religious name was Sister Mary Luke. Another good friend, Sister Martha Bisantz, soon began to call her Lukie – a name that stuck for many years. They were a sort of odd couple, Barbara, tall, and Marty of rather short stature – but their love for one another was “big”. Grey Nun ties go deep. Over the years, Barbara and Lucille remained friends with Joan Clarke Fitzgerald, who had been a Grey Nun for a few years and knew Barbara when she was a young sister. Joan and Bob, her husband, had several children (4 from Bob’s previous marriage and two of their own). Often Barbara and Lucille would “volunteer” to spend a weekend at their home in Stewart Manor so that Joan and Bob could have some free time together. They were good babysitters. Joan used to boast that they had a nurse and a social worker caring for their children while they were away. We are all conscious now of the men, women and children seeking access to the United States – coming from various Central American countries. Barbara was conscious of the needs of migrants long before now – she worked with Sister Marian Adrian at Marian House in Albion, New York. Until quite recently, the Derby Group, a group of Grey Nuns of the Sacred Heart, who first met at our house in Derby, New York, – thus the name Derby Group- and felt called to come together to discuss and act on issues of social justice met yearly. Barbara and Marty were early members of this group. Barbara and Lucille were friends for many years and shared so many things – Morning Prayer, trips, dinner with friends, and life. During these years of illness, Lucille was there, encouraging and lovingly caring for Barbara. Just a week or two before this last illness, she and Lucille went to a Casino in the Catskills – just for a change of scenery. Those of you who know Barbara well know that she was not always too coordinated – so imagine her driving a scooter around the hotel. Many door frames will need a touch of paint! Barbara spent her last days in White Plains Hospital. Sisters Pat Connolly, Eileen Spanier, Eileen White and I, along with Lucille were privileged to be with Barbara – to assure her that we were there and share with Pat and Lucille in their sorrow. On Sunday, the day before her death, Pat, Lucille and the two Eileens prayed with her at her bedside. On the front cover of the Mass booklet, there is a picture of St. Marguerite d’Youville. I have been wondering about Marguerite. I wonder if she were alive in our world today if she would be a social worker. Many of the things that Marguerite did in her life are similar to those which Barbara did in hers – caring for the disadvantaged, working with those addicted, helping women and children have a better life. Barbara began her life as a daughter of Marguerite when she entered the Grey Nuns of the Sacred Heart in 1957 – and she lived that life in her own special way. Here is another quote from one of the women from Hour Children. Barbara, as we send you home to your loving God, know that we have all loved you. Thank you for being part of our lives! Thank you for letting us be part of yours. Gathering/Sharing of Memories: 10:00 a.m. 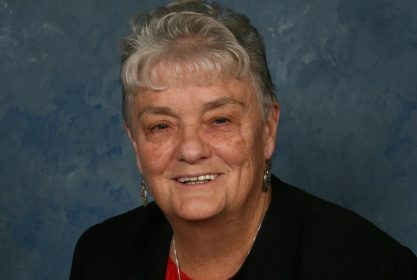 Sister Barbara Connolly, GNSH, (Sister Mary Luke), age 79 died April 1, 2019, in White Plains, NY, in the 62nd year of her religious life. Born June 16, 1939 to Luke and Delia (Hernon) Connolly in Long Island City, Queens, NY, she entered the Grey Nuns of the Sacred Heart in 1957. She earned a BA in Sociology from D’Youville College and an MSW from Fordham University. For 13 years, Sister Barbara taught at various parish schools staffed by the Grey Nuns of the Sacred Heart. These included schools in Atlanta, GA, Buffalo and Jackson Heights, NY. In Pennsylvania she taught in Mahanoy City, Strafford, Paoli and Philadelphia. From 1975 until 2000 she was a Social Worker in several organizations focusing on families and children. In 2000 she became the Social Work Coordinator for Mental Health for Hour Children, Inc., Long Island City, NY, a program designed to keep children in touch with their incarcerated mothers. This work engaged her until retirement in 2014. Predeceased by her parents and brothers, Michael J and Dr. Francis J., survivors include her religious family, a sister, Patricia Connolly, GNSH, sister-in-law Mary Anne Connolly, nieces and nephews, cousins, and dear friend Lucille Esposito. Donations in her memory will be gratefully received by the Grey Nuns of the Sacred Heart. Donations may be made online to the Grey Nuns of the Sacred Heart, or by mail at the following address:14500 Bustleton Avenue, Philadelphia, PA 19116-1188. Services arranged by Beck-Givnish Funeral Homes, Inc.
warm smile. She is now in Heaven with her Mom, Dad and Brothers. May she rest in peace. May she rest in peace and be welcomed Home in joy. Condolences to the community and Sister Pat. Prayers for the family of the Grey Nuns. Thank you all for your witness and service! May she rest in peace. A lovely person! My condolences to the family of Grey Nuns.